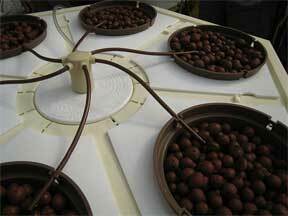 Complete hydroponic kits are available that range in price everywhere from a few dozen dollars to a few thousand. At the lowest end of the scale some kits offer little more than someone could make for themselves by gathering common household items. But they do implicitly package a little knowledge needed to get started. By including seeds, a tray, some nutrient and maybe even some pH testing strips, they suggest what hydroponic setup is needed to get started. They may include a useful booklet, too. The next level up usually costs a hundred dollars or so, but the materials are generally much higher quality. A tray that is specifically designed for hydroponics makes it easy to hold seeds in pre-drilled rockwool blocks that come with the kit. A small watering system might be included. They also usually contain the right nutrients made of quality chemicals. That helps the novice hydroponic gardener get started in the right direction. Nutrient control is a little more difficult in hydroponic gardens and having a pre-mixed solution and clear directions gives your plants the best possible start. Higher-end kits will include some lights. Which lights, and how many, will depend on price and other factors. A few incandescent bulbs cost very little. A few fluorescent fixtures and bulbs are a little more but still relatively modest in price. Metal halide and sodium lamps kits may run to a few hundred dollars. Those same higher-end kits will include a more elaborate watering system. Moisture control in a hydroponic garden is more difficult since everpresent water will tend to increase mildew and other fungi. Having a professional watering system will keep water always at the right level and clean of organisms and keep algae levels low. Since plants are not placed in soil, they will quickly deplete any dissolved oxygen in the water medium. That opens the need for pumping air into the water. Most higher end kits will include a pump and tubing that is designed specifically for hydroponic gardens. Standard aquarium pump setups may work, but the amount and rate of air pumped is different for fish than for hydroponic gardens. Some kits even include a CO2 injector to give plants that extra boost of a compound that is so vital to their growth. Most kits will include a pH testing kit, and the higher-priced ones will have a digital meter rather than simple strips. They also include pH control powders or solutions as part of the overall package. Some will even include a nutrient meter which can measure levels of needed calcium, iron and other compounds. Since temperature control is also more difficult in hydroponic gardens, good kits will include a water heater. Heat lamps can warm water and plants, but often too much so. A calibrated water heater will keep the temperature at the appropriate level automatically. Along with all the needed solutions, tubing, trays and more kits will include any connectors needed for assembly. They also include hanging chains, strings for supporting plants and other useful items. In other words, the kits are just what they advertise themselves as: a complete hydroponics solution.